Please have your shipping information and credit card ready at time of ordering. Items ship either by UPS or USPS. Shipping and Handling charges are based on the size, weight, and number of packages for your order and the distance from our zip code of 44691. Any items listed and priced to include oversized shipping charges are only valid for the 48 states. If you live in Alaska or Hawaii please contact us for shipping charges to your location. You can expect your order from 1-7 working days after it is shipped, depending on the distance from our store. After you place your order most items ship out from our location in 1-2 business days. 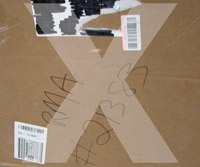 Products that are on backorder or transferred in from Honda warehouses may delay your shipment. Should you place an order on items not in-stock, the parts will ship as soon as they become available. To make either a return or exchange please call us toll free at 1-855-299-7244 to obtain a return authorization number. Once an authorization number is issued you may return the approved items within 30 days of the original invoice date. Returns past 30 days will be refused. All returns require a RETURN AUTHORIZATION NUMBER. This return number helps us identify your package and the reason for the return when it arrives back to our store. DO NOT submit a return without one as your return will not be processed. Exchanges for similar products or items of similar value will not be assessed any restocking fees. Unless a shipping error on our part is the reason for the exchange, you will be responsible for shipping costs both ways. A refund will be given for the purchase price of your item(s) less a 20% restocking fee. Shipping charges are not refundable unless we make an error in your shipment or if the item arrives damaged or mispackaged from the manufacturer. Once the carrier has taken a package into their possession they will not refund those charges. Shipping costs incurred from any refused shipments will be the responsibility of the consumer. - Any and all electrical parts, fluids and tools are NOT returnable for any reason. - Items that are used, test fitted, previously installed or not in completely new condition may not be returned. Prepare Your Return - IMPORTANT! 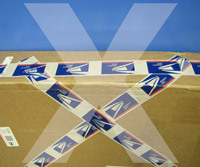 Items are to be in brand new, unused condition and sent back exactly how they were received. 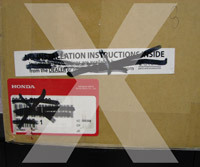 *DO NOT cross out the red Honda Part Number Labels. These labels must be visible and intact. *DO NOT write directly on the packaging. Use our return label or create your own and tape it to the box. *DO include all hardware. Any applicable hardware must be unopened and accompany your return. *DO make sure that all protective packing is in place and that all items are properly protected for transit. *DO insure your returned items. We cannot refund for items that are damaged or lost during transit. Complete and enclose a return form with your packages and print a return label. You may return your items using any carrier you like. Visit your local post office or find a UPS location here. If your order has damage or is missing components, please notify us by phone within 48 hours. Report any visible damage to the carrier and inspect the package contents. College Hills Honda is not responsible for damage done to parts or vehicles during or after installation. To help avoid potential issues please make sure the parts you are ordering pertain to your vehicle and that you follow printed instructions carefully. Any other questions call 1-855-299-7244.